Looking for a new guest bed? Want to treat your guests to a decent night’s sleep, whilst retaining maximum levels of space in your spare room? Look no further than the Rialto Light Grey Fabric Guest Bed with Trundle. We all like to maximise the amount of available space in our home. This can be especially true in the spare bedroom, which often doubles as a storage room for many households. This hardwood bed frame offers clean lines - charmingly finished in a fresh grey linen fabric. The slide-away trundle bed allows you to sleep two people – but when tucked away the bed frame only takes the space of one. Perfectly functional and practical, this Rialto fabric guest bed will add contemporary charm to virtually any bedroom style. The integrated trundle bed fits directly below the guest bed, tucked away nicely out of view when not needed. This removes any chance of storage space within the bed frame itself – but tucking the trundle bed away will free up space elsewhere in your room. This is the ultimate practical choice when it comes to hosting guests overnight or across a holiday period – perfect for kids and adults alike. Sprung slats across the solid base provide supreme comfort and extra support where it is needed. This set-up will also extend the life of your mattress, saving you money down the line. The width of this bed is 90cm and will be delivered to your door flat-packed, ready for you to assemble. We only ha e 197cms and the length is 206cms Can the bed be usedl without the headboard or base board enabling us to squeeze it in ? The Rialto must be build with the headboard and footboard as they are both structurally integral to then build of the bed and its rigidity. Can I buy one of the 25 “ mattresses to go on the top half of the Rialto trundle bed. Absolutely. The Rialto Light Grey Trundle Bed needs a 15-18cm mattress on the trundle itself for obvious reasons but the main bed can have any mattress depth desired. The dimensions are all total lengths. The trundle is 95cm wide and the bed itself is 97cm so you'll need 192cm to fully extend the bed. The bed is not attached to the trundle so you can have it wherever in the room. It is designed for adults' use. The Rialto Grey Fabric Guest Bed has 6 castor wheels on the Trundle. it says the height of the bed is 102cm, is this from floor to top of mattress? seems very high. The 102.5cm measurement refers to the height from the floor to the top of the headboard, not to the top of the mattress. The Rialto Guest Bed's approximate width when extended is the 97cm of the main bed plus approximately 95 for the guest bed, making it 192cm. Can the trundle underneath be removed completely to be in an another area of a room or does it remain attached to the main bed at all times? 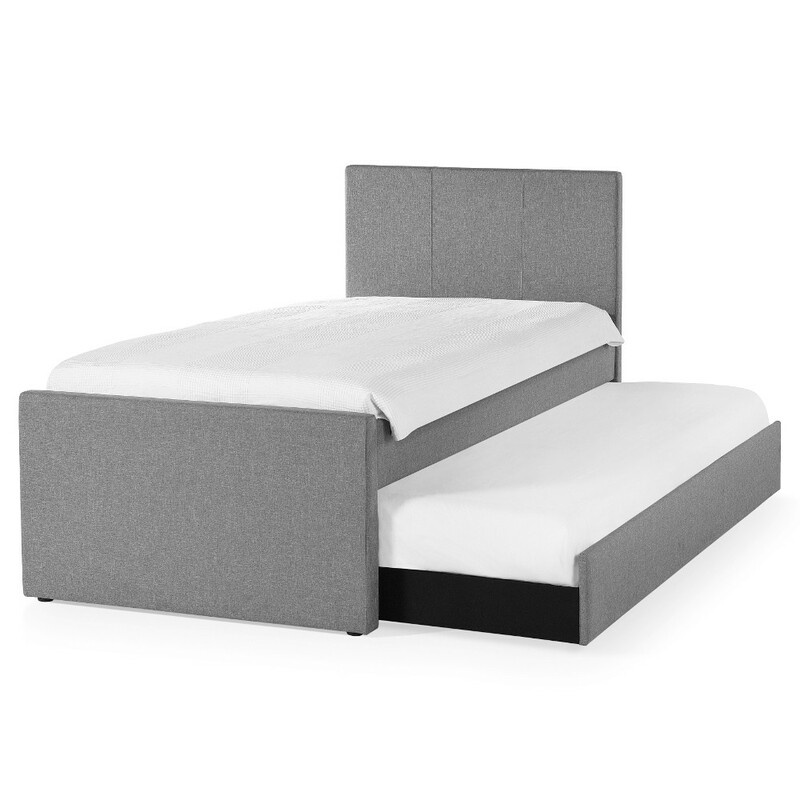 The Rialto Grey Fabric Guest Bed has a separate construction for the main bed and the guest bed. Once erected the guest bed is simply placed underneath the bed so can be placed at any part of the room. The Rialto Guest Bed with Trundle is fitted to two UK Size 3ft mattresses (190 x 90 cm) and the maximum depth of said mattresses is 15cm. Does the bedhead remove so that I can make the underneath bed come out on the opposite side? The Rialto Guest Bed can be assembled so the trundle is accessible from either side. Does the underneath bed raise to the same height as the single bed to make a double? The Rialto Guest Bed does not raise up to make a double bed.